SpeedSport Promotions : Gallery Opening Is A Success! Gallery Opening Is A Success! The Speedsport Gallery enjoyed a successful opening weekend at the Silverstone Classic race meeting. 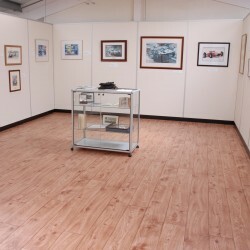 The Gallery was opened to the public at the Silverstone Classic meeting. Many art and motorsport fans attended the opening and enjoyed an initial look at the high quality paintings and automobilia we have for sale. The opening proved to be a success. There was something for everyone, with exhibits ranging from our collection of original paintings by artists such as Dexter Brownand to original Monaco Grand Prix posters . We were delighted to sell some of our collection and to meet so many enthusiasts. We will be holding a formal 'by invitation only' opening evening in late September, so please email us if you would like to attend.